Due to its size and fertility, Naxos is one of the most self sufficient islands of Cyclades, with its own production of agricultural and dairy products. The famous Naxian cheese, potatoes and citrus are just a small example of them. 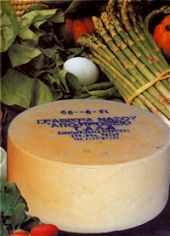 There are plenty of places you can buy Naxian cheese - some of them are just cheese shops. Try (and we sure you will buy) "Kefalotyri", "Anthotyro" and "Ksynotyro".